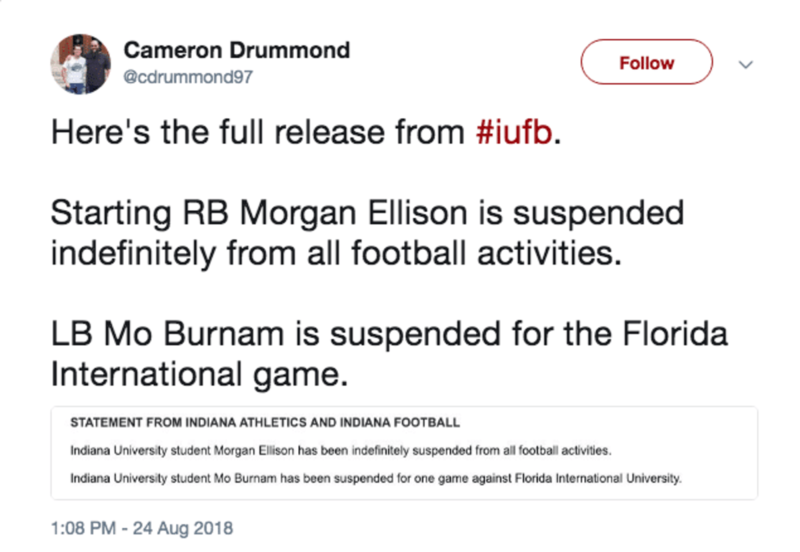 On Aug. 24, Indiana announced sophomore running back Morgan Ellison had been suspended indefinitely from all team activities. The reason for the suspension was not revealed, and IU said in its press release it would not comment further on the suspension. We now know exactly why Ellison was suspended. But on Oct. 2, Indiana head coach Tom Allen announced Ellison had resumed practicing with the team. More than that, Ellison had been around the team prior to the Oct. 2 announcement. On a Big Ten coaches teleconference on the 2nd, Allen said that he has regularly met with Ellison through the course of his suspension. “Day by day” turned into “just today,” as the university suspended Ellison 24 hours later. Step back and consider the facts here. Indiana suspended Ellison on Aug. 24, fully aware Ellison was under investigation for sexual assault. At some point over the ensuing weeks, Ellison is allowed to return the team. He’s then allowed to return to the practice field, and Allen doesn’t refute that he may play on Saturdays at some point — all while his player is under investigation by the university for sexual assault against a fellow student. What message does this send to the women of IU? I’ll tell you what message it sends: We think so little of you that an alleged sexual assault by one of our players will keep him off the practice field for a few weeks. Now, I don’t want to imply Allen or Indiana football don’t care about women, because I don’t think that’s true and because I don’t think that’s fair. Indiana University should not have given Indiana Athletics the opportunity to reinstate Ellison ahead of the investigation’s end date. If there’s one thing we heard over and over again during the Urban Meyer-Zach Smith saga, it’s that football coaches are not investigators. They aren’t qualified to investigate something as serious as a sexual assault case, and it’s not fair to anyone involved — victim, accused or coach — to place that responsibility on their shoulders. Like every university, IU has a system in place to handle such investigations, but it didn’t go far enough in this case. If IU was investigating Ellison, then the university should have suspended Ellison from all team activities through the course of the investigation. If said investigation clears Ellison, the university then allows him to return to the team. If it finds him guilty, as it did Oct. 3, then it extends his suspension for another 30 months. The university knows the facts of the case, and the university knows the timeline of its investigation. The football team does not. So the university should have safeguarded all invested parties by suspending him pending the investigation’s completion and not let that burden fall to the football program. Not having such a failsafe in place invites a worst-case scenario where the head football coach — who, again, does not know the facts of the case — reinstates a player the day before the university suspends that very same player. We have no reason to think or believe that Indiana football and Tom Allen don’t care about women, but Indiana University brought that perception to light by not letting its left hand know what its right hand was doing.